“The Bible is unique in its claim that the universe didn’t exist until God created it,” Dr. Hugh Ross told students and faculty at University Chapel on Wednesday, April 4. Ross, a renowned astrophysicist, former skeptic turned Christian apologist, and founder of Reason to Believe, discussed the story of creation in Genesis. 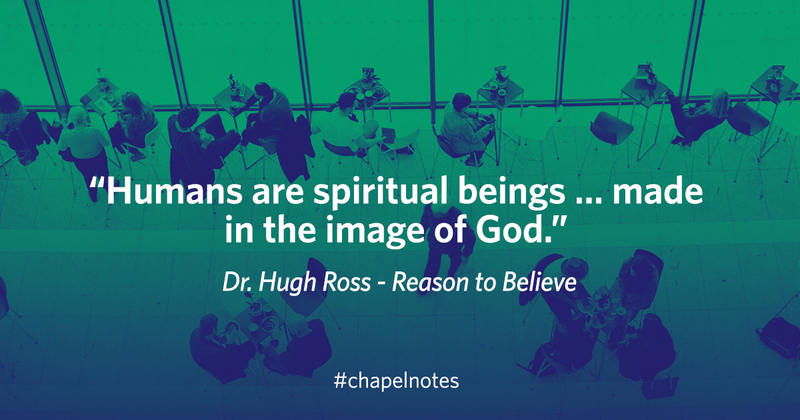 When people understand it, their view of the Bible and creation changes, Ross said. Many of them see Genesis as a “problem,” as proof of a space-time beginning impling a Causal Agent beyond space and time who creates our universe of space, time, matter, and energy, according to Ross. Ross also mentioned how the Hebrew word “Yom,” a key phrase meaning “day,” serves as a point of contention for apologists and atheist as interpreters have trouble making sense of it in English. He continued, explaining how it’s used in a few different ways in Genesis; in referencing part of the daylight hours, all of the daylight hours, one calendar day, and a long, but finite, time period. Understanding this meaning of light or daylight, is important because when light first shone throughout the earth, it induced photosynthesis. Subsequently, plant and animal life began growing. And this life, these creations of God, point us towards him. “We have a rise of Atheism because for the first time a majority of the human population lives in dense metropolitan cities where they’re cut off from contact with wild birds and mammals,” Ross said. Although people are themselves also a creation, they are “spiritual beings … made in the image of God,” said Ross.